Whole, unpitted Kalamata olives grown and hand-picked in Greece’s fertile, sun-bathed region of Messinia in the Southern Peloponnese. Excellent as an hors d’oeuvre, for snacking, or served with toasted bread and olive oil. Ingredients: Kalamata Olives, Extra Virgin Olive Oil, Vinegar, Salt. Crushed from organic hand-picked olives of San Polo, Chianti. 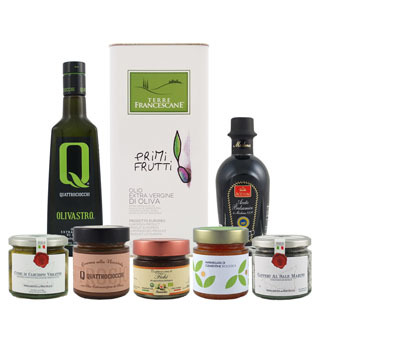 DOP certified organic oil made from Hojiblanca and Arbequina olives. Green olive pate made from Sicilian Nocellara del Belice olives.